If you follow my Instagram then you will already know how obsessed I am with macaroons so when a little birdy told me Lidl were doing 'French Week' and that they'll be doing 12 macarons for £2.99, I just had to hop on board. 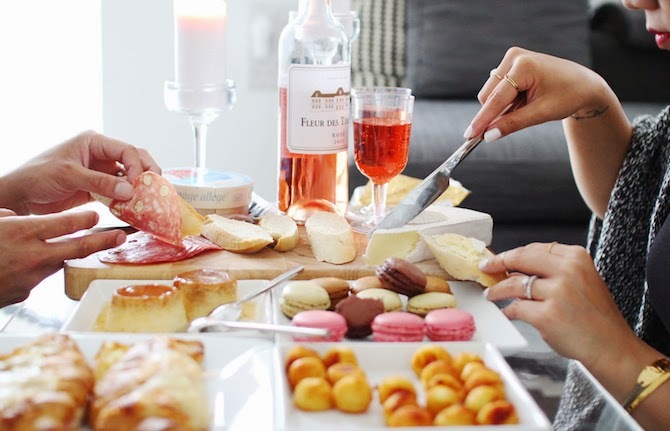 Browsing their 'French Week' deals, there are too many great choices so I decided to pick up more than the macarons and create my very own French picnic style meal at home. All items are sourced where possible in France, obviously the fresh french baguette and pastries won't have been. I was SO surprised at how affordable everything is. I got some potato balls for 99p, brie also 99p, a couple of cheese and ham croissants for £1.99 and 4 creme caramels for 99p too!! That's insane if you ask me. Of course, what's a picnic without some wine, I opted for the Fleur Des Templiers which was also a cracking price - £5.49! I literally had to stop myself from picking up more. When Tommy arrived home, he was super impressed and it makes a great change from the usual lunch/dinner. Tommy LOVED the ham and cheese croissant and potato balls, he definitely wanted more. It's also a great idea for a girls night in, it took me less than 20 minutes to prepare it all. You check out the offers HERE. If you decide to pick up some of these bargain items let me know by hash tagging #FrenchWeek #LidlSurprises on Twitter. wow, Lidl do macarons! And for so cheap too! Ohmygod so many macarons, they all look so yummy! I cannot wait to get down to Lidl now!!! Oh my god... These looks absolutely amazing... So jealous!